On April 10, 2010, I was “on display” at an adoption event at Petco in Nanuet, NY. I know “on display” may seem a little negative to say, but that’s how I felt. Family after family, person after person, just passed me up. After a while even the most confident girl starts to feel there’s something wrong with her. This went on for almost a year, and then it happened; a human stopped by my cage and couldn’t take her eyes off of me. It was Mother. She "oohed and aahed" over me and didn’t even look at the other cats. For the first time in a very long time, a human had eyes for only me. I liked her and I could feel her positive energy, and I felt something else, too; love. I didn’t get my hopes up too high, though, because I didn’t want to get let down again. Especially when she left without me. About 90 minutes later I was home, but it felt so strange to say that word. The last “home” I had ended up with the humans moving and me being thrown outside, left behind, to fend for myself. But I had a feeling deep down inside that Mother wouldn’t be like that. The house was already set up for the arrival of a queen, complete with fancy dishes, scratching posts, beds, catnip toys, and plenty of treats! There was everything there I could ever want, and it has never changed. I write to save lives because not all cats are lucky to have a person walk past their cage and immediately fall in love with them. And not all cats are lucky to be in a no-kill shelter like I was. I could have lived there forever it I needed to, but many other cats are euthanized in shelters before they ever find their real forever homes. 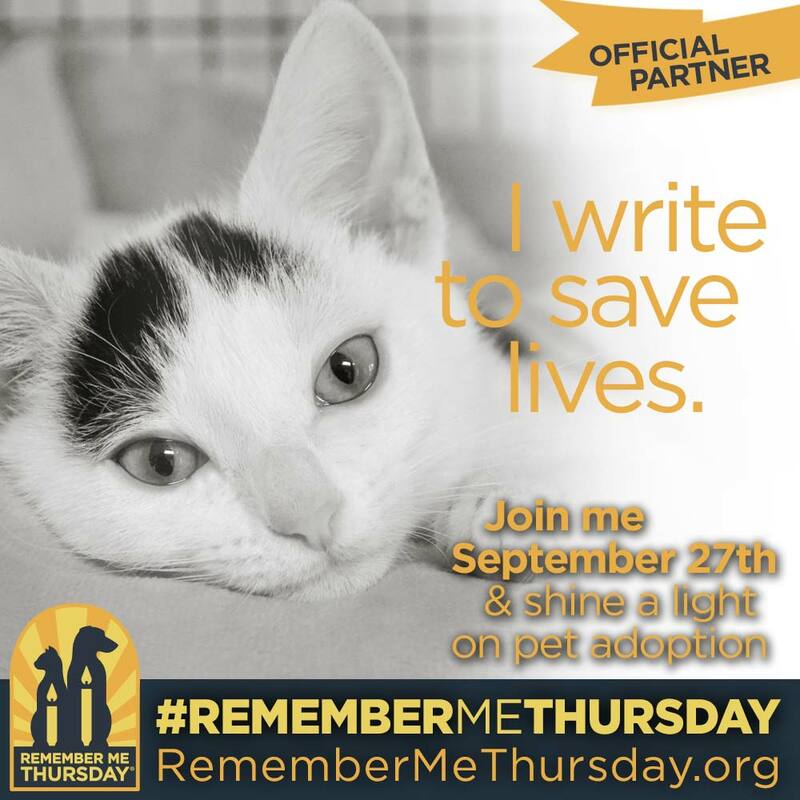 Life in a shelter can be lonely, and I want to shine a light on pet adoption so more cats can be adopted quicker and not have to spend so much time in a cage. As I sat at the adoption events week after week, I couldn’t figure out what was wrong with me. I kept wondering “why doesn’t anyone like me?” This is why I want to be a loud voice to spread the word about adoption. No pet should ever feel that way. 1. Grab the badge below and insert it into your post. 2. 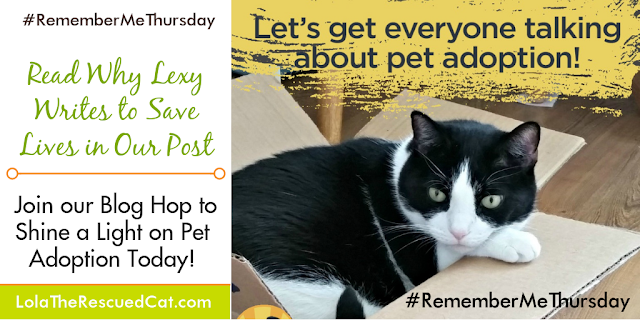 Publish your post on or before Thursday, September 27, 2018. Then start hopping! 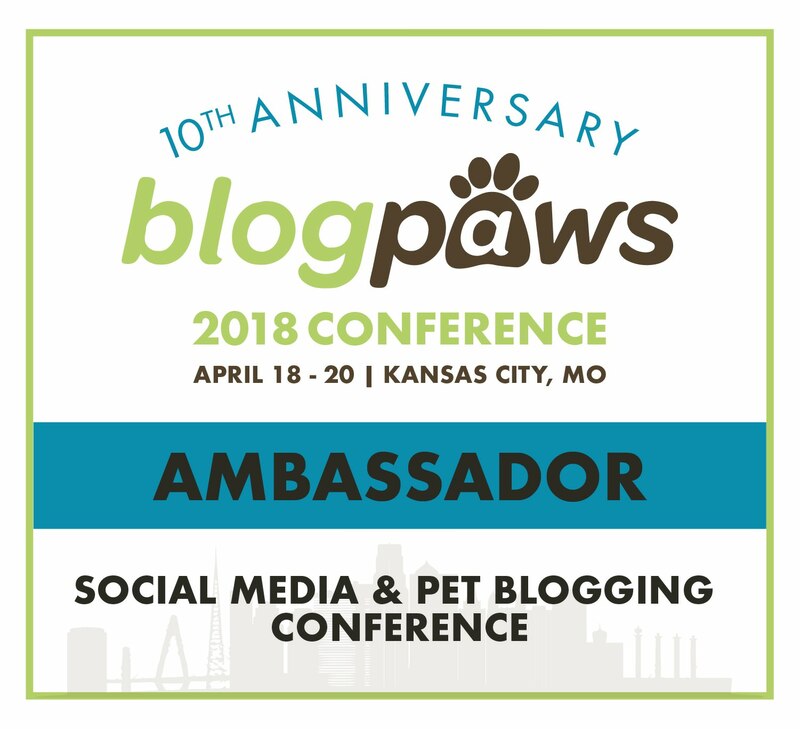 Be sure to visit the other blogs participating in the hop to read about how they are shining a light on orphan pets! 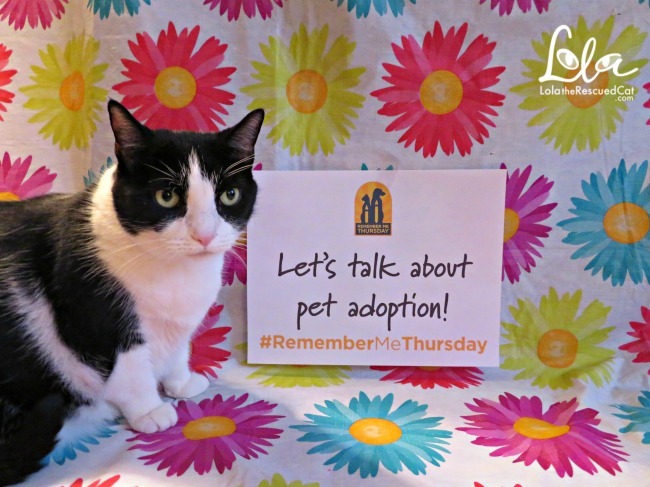 Have you adopted a rescued pet? Tell us about them! Thank you for your support of this event ... we'll be joining, Dougie Dog was an adopted rescue, saved at the very last moment! Rescue is the only way that we roll! You are a wise one Lexy! Adoptions rock! 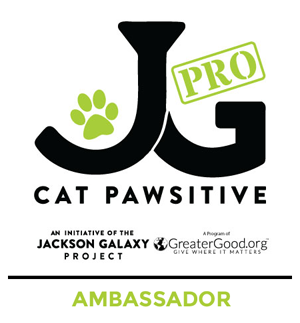 Thank you for sharing information about this organization! I'm so happy that your mom adopted you, Lexy! Like you said, though, not all cats are as fortunate, and that's why it's great that you're writing to save lives -- and shine a light on orphan pets. I love that photo with the candle. Beautiful, just like you are! All of my cats have been rescues and they always will be! It breaks my heart to think of cats that never find their forever home. We'll be participating in the hop next week! Lexy, you are so beautiful and even more so, if possible, in that candlelit photo. Your story always touches my heart. We will participate. Like others, there have only been rescue kitties in this house! That's a wonderful adoption story, Lexi! Well, the part about being adopted was - before that was really sad. Anyhow, I'm so glad you got the home you did and now you can help other kitties in the same paws as you were. What a heartwarming adoption story! I don't have any cats, my fiance is allergic, but I think I'll try to join the hop next week and share stories about some of the small and exotic pets I've adopted. So many people think of cats and dogs when they think pet adoption, but there are so many other types of animals out there needing homes too. What a beautiful post you wrote Lexy, you had me in tears. I can just imagine how sad it is for those poor animals who get passed up, and even worse end up in those horrible slaughterhouses they call shelters. You were truly blessed and now you're doing a great job helping others find their happy endings too. I'm SO behind! I haven't even started this post yet! Bad bad Mommas! We love learning more about you, Lexy. Like us, you got lucky to be adopted by a Mom that loves you so much. I just love your adoption story, Lexy! It's so heartwarming and beautifully written. You are one lucky cat!! Thanks for shining a light on pet adoption. There are many things one can do to help save lives. Writing to save lives is an easy and wonderful way to contribute. 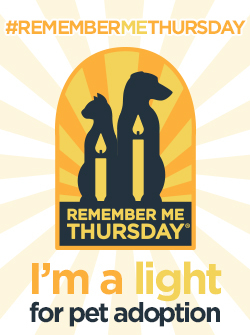 The more people who know about #RememberMeThursday the better. People have no idea that the cat they surrender to the shelter will often be dead within days. This has to stop, so does people's arrogance and stupidity about animals. I have lots of rescue cats - My Plush is my best story - left in a foreclosure and rescued near starvation, he's now a winner in the cat show world as a household pet. I'm not sure I'll have a post for the hop but I hope it is a great cat filled day with many cats finding new homes. Lexy thanks so much for sharing your backstory. I'm so happy that your Mom found you and made her home your forever home too. Thanks for sharing this important message and the throwback photos. So adorable. Thanks for sharing your story! I hope it will inspire others to adopt! We know how lucky your mom was to have found you! 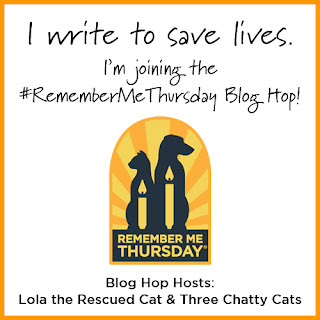 Thank you for sharing your story and for helping with the Remember Me Thursday Blog Hop. We've reminded everyone on the CB. Thanks for hosting the blog hop. 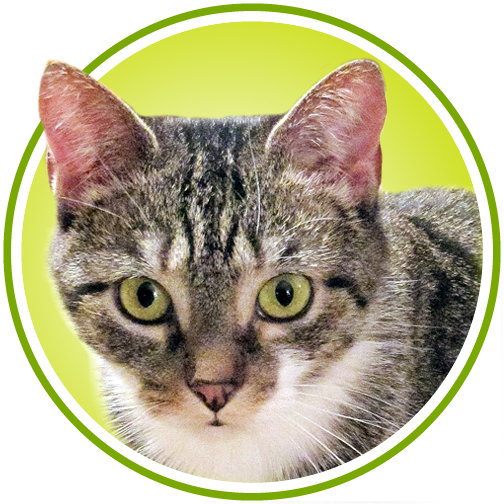 I have entered two pages to share Pet Adoption stories from Australia. 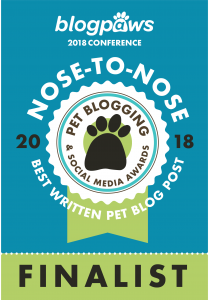 One is examples of Pet Adoption stories on our website, and the other is actual Entrants of the #JetpetsRescueAwards2018 who opted in to share their Pet Adoption or Foster stories - Judging is still in progress, but you can see some of the Entrants! 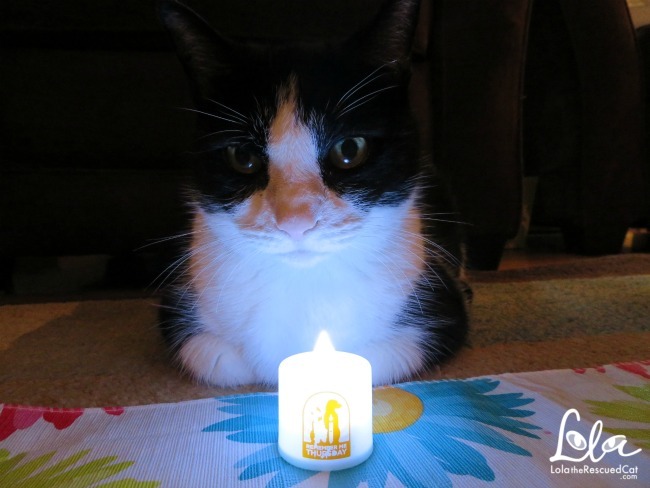 Lexy, we love the photo of you with the Remember Me Thursday candle. The Tribe of Five opine to save lives too. Every one of us is a rescue and we want every single feline to have a furever home! Mee was about to give up an LadyMummy came to see mee. Shee burst inn to teerss an called mee BellaDharma.....(mee name was just Bella). Anywho bee-fore mee cuud think or blink mee was put inn a purrple carrier an off wee went. Today iss 22 dayss with Lady Mummy an it feels SO-O guud to bee here. There are beds an mee picked mee own blanket an toyss an LadyMummy playss toyss with mee an thee food iss dee-vine! Oh an there iss a Condo mee can go out inn an watch thee world go by, knowin mee not need to look fore a home anymore. 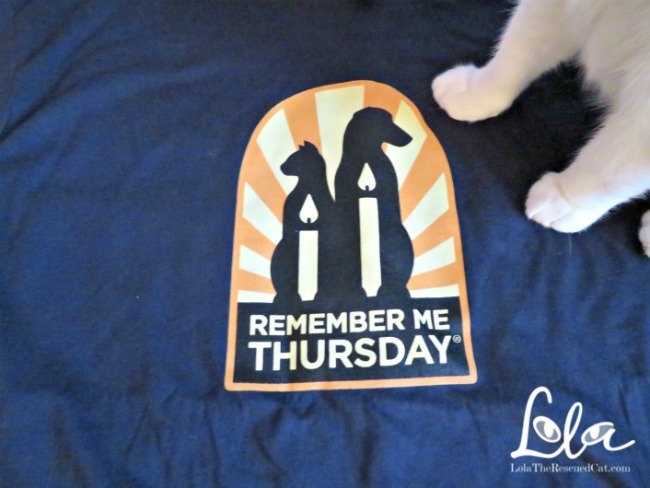 Mee missed THE Remember Me Fursday hoppy so mee thott mee wuud share here. Mee asked LadyMummy if wee can 'follow' you an shee said YES! Yippee! PS - I Pinned this to share, too! !